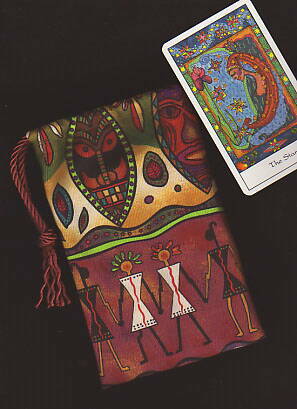 Regular Tarot Bags - Sisterhood Regular Tarot Bag - Tarot Bags, Tarot Cards, Cloths, & More! This brightly-colored, festive fabric was chosen for a tarot bag because the drawings on it symbolize female friendship. The lower part of the bag shows women of different races linking hands in world sisterhood. While the upper part shows tribal masks and decorative shields from around the world. 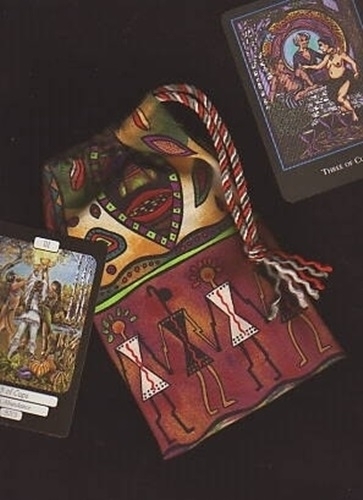 Coordinations: Notice how well the bag goes with the three of cups cards from The World Spirit Tarot and the MerryDay Tarot. We also think the Tarot of Trance is a wonderful color match because of its bright energetic drawings (see 2nd pic.). Hold your more colorful cards up to the screen to see what matches you come up with. Naturally, the African American Tarot is an exellent choice also. Color scheme: Black, white, neon green, olive green, teal, brick, red, purple, burgundy, medium brown, yellow, gold, lt. orange, forest green. Size: Regular, 5 x 8 inches. Fits most standard size tarot decks.